Vancouver, BC -- Aben Resources Ltd. (TSX-V: ABN) (OTCBB: ABNAF) (Frankfurt: E2L2) (the "Company") is pleased to announce, further to its News Releases on December 18th, and 19th, the closing of its non-brokered flow-through private placement for the aggregate of CAD $563,125.00. The Financing consisted of 3,754,167 Flow-Through Units at a price of CAD $0.15 per Flow-Through Unit. Each Flow-Through Unit purchased included one flow-through share as well as one common share purchase warrant ("Warrant"). Each Warrant will entitle the holder to purchase one additional non-flow-through common share for one (1) year at a price of CAD $0.20 per common share. In connection with the financing, Aben issued a total of 125,265 warrants to finders (the "Finder Warrants") who introduced certain subscribers to the private placement. Each Finder Warrant will entitle the finder to purchase one additional common share for one (1) year at a price of CAD $0.20 per common share. The Company also paid to finders a total of CAD $18,789.75 in cash fees associated with this financing. Shares issued in connection with this private placement and any shares issued as a result of exercise of warrants will be subject to a hold period expiring April 30, 2018. 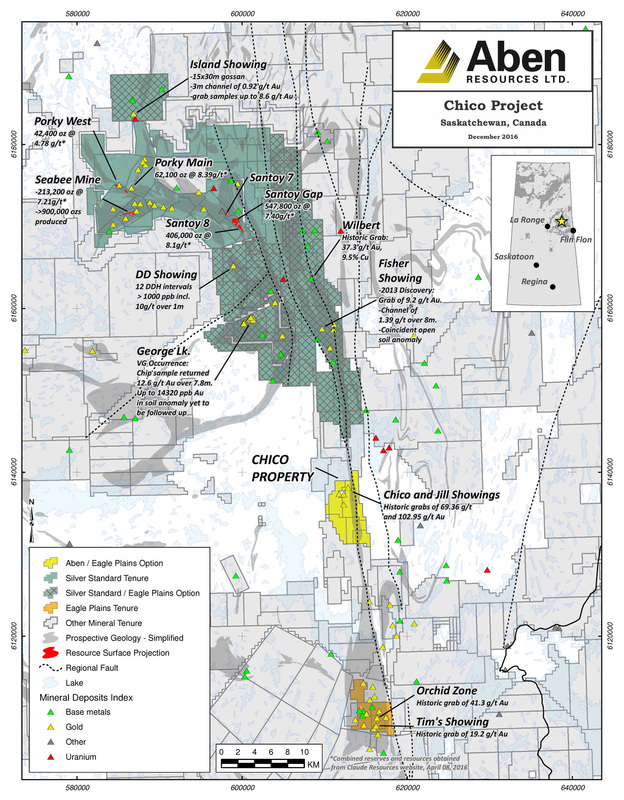 The Company intends to utilize the proceeds from the private placement for an upcoming 2018 exploration and drilling program at its Chico Gold Project in Saskatchewan. Aben Resources has approx. 63.7 million shares issued and outstanding.